The 24-year old defender has completed the deal for an undisclosed fee thought to be around £17m. Although Hull were relegated from the Premier League, Maguire had an impressive season, with solid defensive stats and a willingness to go forward and have a crack at goal. The Sheffield-born England under-21 international should be a vital addition to a City defence that had began to look stretched towards the end of the season. Maguire, the first signing under Craig Shakespeare, told LCFC TV: “There were a number of clubs interested, but when I met the manager here, he pretty much swayed it into the direction of this club. 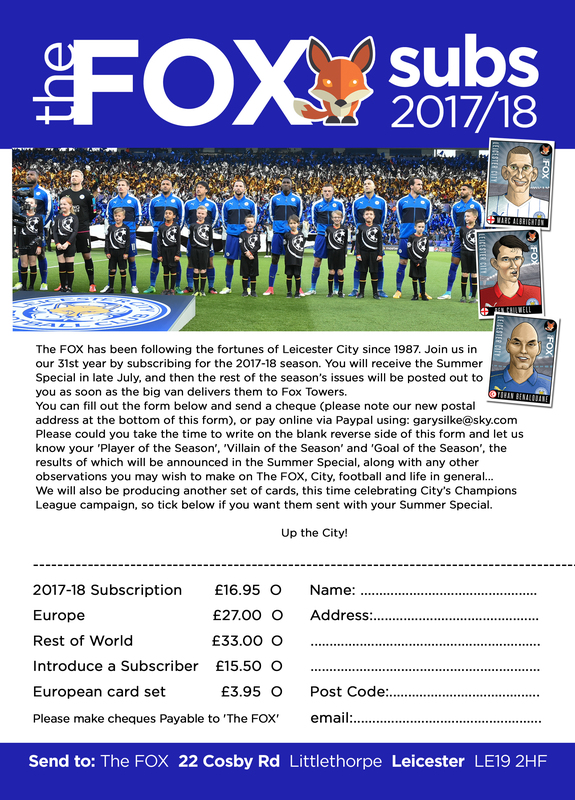 You can either print and post the above subscriptions form [click for a bigger version] or pay online via Paypal below. Hull were manager-less, favourites to go down, had spent nothing on players, only had 13 fit players, and the fans were protesting… it all seemed too good to be true for City’s first game, and it was. Claudio Ranieri made three changes to the starting line up at Wembley, with Gray in and Musa and Hernandez making their Premier League debuts. City had the first chance of the game in the third minute, when Gray pushed forward from midfield and hit a long-range effort that took a looping deflection onto the roof of the net. Three minutes later Hull threatened Schmeichel’s goal, Davies flicking a near post header narrowly wide of the far post from a Snodgrass corner. Gray then found himself in a good position from a Fuchs long-throw but wildly sliced his shot. In the 20th minute, a good run and cut back by Musa on the left set up Vardy beautifully, but the Engand striker produced an airshot. The ball ran through to Mahrez, who side-stepped one defender in the area, but then fired wide. In a strong spell up to the break for City, several chances came and went. Mahrez battled through two defenders down the right and pulled a ball back for Drinkwater who curled a shot inches wide wide of the left hand post. Fuchs went on a run down the left and played balls off Gray and then Musa,before bearing down on goal, but Jakupovic came out well to block his prodded effort. Vardy followed up but saw his shot blocked by Livermore; and Mahrez seized on the loose ball and went round a couple of defenders but sent his shot just wide. Musa then pounced on a stray pass from Diomande and raced past Davies, before setting up Vardy, who miscued his shot over the bar. City were to pay for those missed chances just seconds before the half time whistle when the Tigers took the lead with a bizarre goal. Davies got his head to a Snodgrass corner, but Schmeichel managed to parry it away to his left. As the loose ball bounced up to head height both Hernandez and Diomande attempted acrobatic efforts. Both connected, but the latter appeared to get the final touch as the ball found the net via the bar. City were soon on level terms after the break, however, when referee Mike Dean ruled that Huddlestone treading on Gray’s heel had occurred inside the area, though replays indicated it was at least two feet outside. Mahrez rattled his penalty kick straight down the middle and the Champions were back on track. However, the script went awry again ten minutes later. A hurried throw-out from Schmeichel conceded possession, and a swift move down the right saw a probing cross from Elmohamady that was only half cleared by Simpson. The ball sat up nicely for Snodgrass to fire an unstoppable half-volley just inside the right hand post. With City struggling to get past a dogged Hull back-line Claudio Ranieri made a couple of changes in the 68 minute with Okazaki and Amartey replacing Gray and King. Okazaki introduced a bit of the zip and tempo from last season that appeared to be lacking in this game, and one charge down the middle saw him upended by Davies. Mahrez delivered a decent free-kick round the wall, but Jakupovic got down well to tip it round the post. Hull were very well organised in defence of their lead by this stage and City were looking strangely flat. Okazaki hit one long range effort well over the bar. On the home side’s rare ventures upfield they looked more threatening and more cunning. 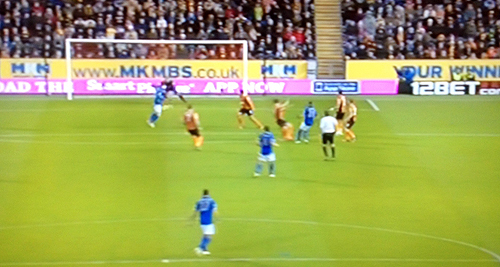 From a free-kick on the right Snodgrass tried to catch Schmeichel out with a shot towards the near post. Fortunately the City keeper was alert to the danger. City eventually ran out of ideas and steam and couldn’t launch a concerted bid for an equaliser, even during 5 minutes injury time. Caretaker manager Mike Phelan and his side, with Snodgrass inspired, had done a magnificent job on the Champions. City became the first title-defending club to lose their first game of the season since 1989. Hull: Jakupovic, Robertson, Davies, Meyler, Huddlestone, Hernandez, Snodgrass, Clucas, Livermore, Diomande, Elmohamady. Subs Not Used: Kuciak, Maloney, Tymon, Bowen, Luer, Olley, Clackstone. Leicester: Schmeichel, Simpson (Ulloa 84), Hernandez, Morgan, Fuchs, Drinkwater, King (Amartey 68), Mahrez, Gray (Okazaki 68), Musa, Vardy. Subs Not Used: Zieler, Chilwell, Albrighton, Kapustka. Referee: M Dean. Attendance: 20,137. Claudio Ranieri stuck to his League Cup policy of giving those players who aren’t making the first team a run out, which meant 10 changes for this trip to Hull, with Ben Chilwell making his debut at left-back. City went close within a minute of the kick-off when Kramarić fired a long range effort narrowly wide, but then there was a scare at the other end when Luer should have opened the scoring for the Tigers but placed his shot from close range too near De Laet, allowing Schwarzer to gather. Soon after, Maloney sent his effort into the side-netting as the Championship side threatened again. The game then got bogged down in midfield with few chances before Diamé sent a shot well over when well placed just before the break. The stalemate continued into the second half and, after Diamé and Taylor both went close for Hull, Ranieri took action in the 65th minute – Kramarić and Okazaki making way for Drinkwater and Vardy. This gave City a livelier outlook and Vardy set up Dodoo but he shot wide. After Albrighton saw his cross for Vardy intercepted by keeper Jakupović, Ranieri made a further change, bringing on Mahrez for Dodoo as City attempted to avoid extra-time. Hernández forced a good save from Schwarzer, and then Inler fired wide, meaning an additional thirty minutes. City finally broke the deadlock in the 100th minute… with loud home appeals for a penalty still ringing out Drinkwater broke swiftly upfield and set up Vardy whose shot was saved by Jakupović, but the rebound fell for Mahrez who stroked it home to the delight of the large travelling support. 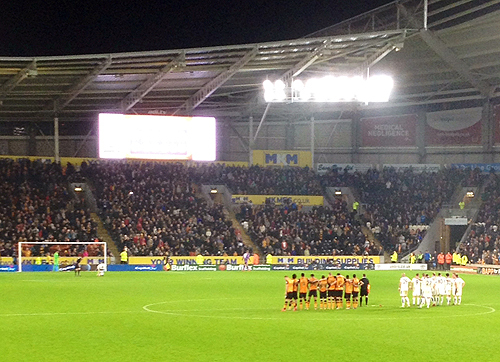 However this lead only lasted 5 minutes as Hull levelled just before the extra-time break. Akpom’s low shot was blocked by Schwarzer but only as far as Hernández, who couldn’t miss from within the six yard box. It didn’t start well when Mahrez had his spot-kick saved, and City never got the opportunity to come back. Hull: Jakupović, Odubajo, Taylor (Hernández 79), Huddlestone, Maguire, Maloney, Diamé (Meyler 110), Hayden, Dawson, Robertson, Luer (Akpom 74). Subs Not Used: McGregor, Bruce, Clucas, Elmohamady. Leicester: Schwarzer, De Laet, Benalouane, Wasilewski, Chilwell, Dodoo (Mahrez 84), Inler, King, Albrighton, Kramarić (Drinkwater 65), Okazaki (Vardy 65). Subs Not Used: Schmeichel, Morgan, Simpson, Blyth. Referee: Mr. S. Attwell. Attendance: 16,818. Nigel Pearson persisted with his five-man defence, but made two changes to the side that lost at Manchester City: Vardy and De Laet in for Simpson and Konchesky with Schlupp moving to wing-back. If it was nominally a more attacking line-up with more mobile wing-backs, that didn’t translate into chances as City struggled to make any impression on a struggling Hull side. After Kramarić sent a shot narrowly over the bar Hull should have gone ahead in the 15th minute. 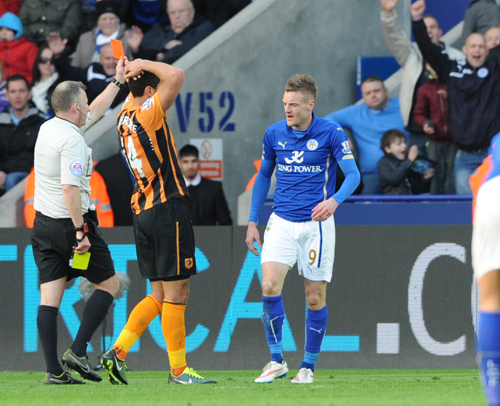 Elmohamady teed up Jelavic for a golden chance which he somehow scuffed to let City off the hook. Soon after that he had the ball in the net, but N’Doye had impeded Schwarzer during the build up. Off target efforts from Mahrez and Kramarić and a Mahrez free-kick deflected wide were the only other noteworthy incidents in a half seriously lacking in Premier League quality. The second half wasn’t a great improvement. Pearson made his first change in the 61st minute bringing Ulloa on for Kramarić. City greatest threat came from Vardy’s strong running down the left. 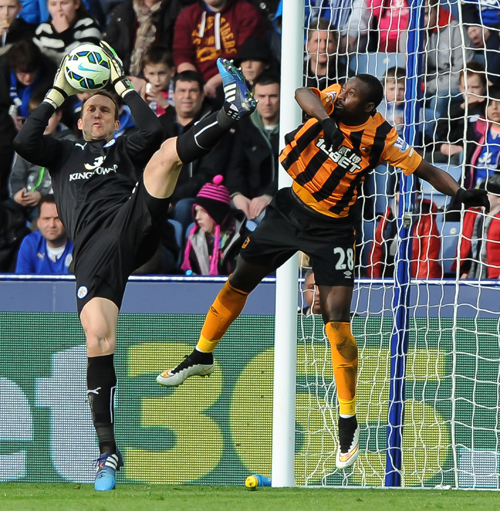 He won a corner, but Huth couldn’t keep his header on target. Hull were getting physical at this stage. Dawson was booked for a foul on Vardy and then Bruce also saw yellow for clattering Mahrez. Vardy then ran almost the length of the pitch before Huddlestone, already on a yellow, brought him down to earn a red card. City couldn’t punish Hull with these free-kicks and when a defender was eventually sacrificed against the ten men, Lawrence on for De Laet, it seemed to make no difference. 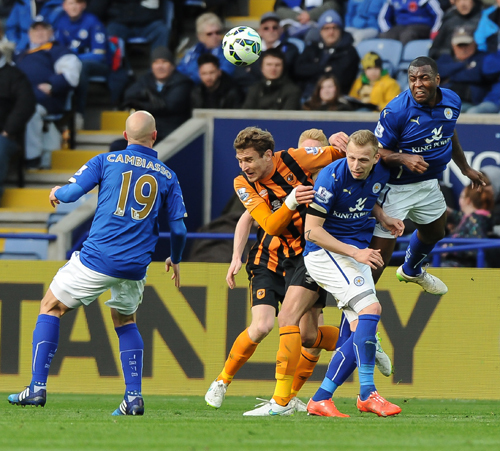 In the closing stages of a game they could not afford to lose there was no urgency and no pressure on the Hull goal. In fact Hull should have won the game when City’s defence were caught napping by a quickly-taken free-kick by N’Doye which sent Hernandez in on goal, only for Schwarzer to block well. It was a woeful display from City who now need a miracle to prevent an instant return to the Championship. Nigel Pearson’s comment that we need five wins, when we have only managed four all season, was almost as ridiculous as his descent into foul language and insults at the end of the press conference. A shameful day all round… and no end to it in sight. Leicester: Schwarzer, De Laet (Lawrence 76), Upson, Huth, Morgan (c) (Nugent 84), Schlupp, Vardy, Cambiasso, James, Mahrez, Kramarić (Ulloa 61). 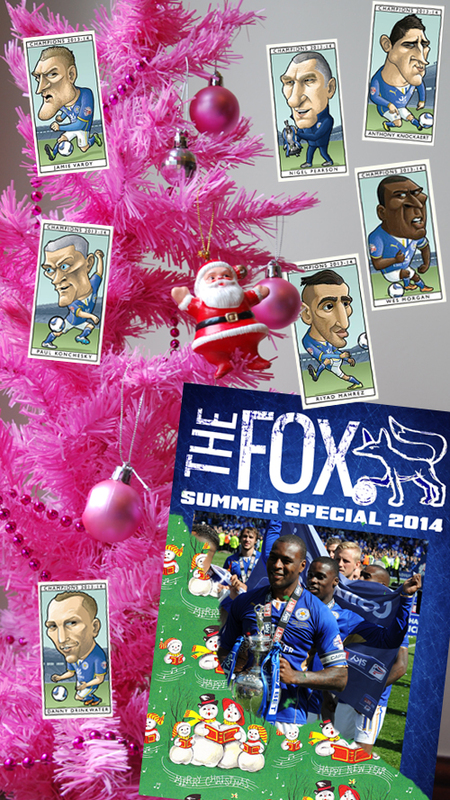 Subs Not Used: Schmeichel, Drinkwater, King, Wasilewski. Hull City: McGregor, Bruce, Huddlestone, Livermore, McShane, Jelavic (Meyler 77), Dawson (c), Ramirez (Hernandez 84), Robertson (Quinn 77), Elmohamady, N’Doye. Subs Not Used: Figueroa, Davies, Harper, Aluko. Referee: J Moss. Attendance: 31,556.